Frequent AR shooters will find this 1000-round case of PMC X-TAC ammunition ideal for their needs. This case holds 50 20-round boxes of bulk-packed ammo made to M193 military specifications. These rounds offer strong ballistic performance, reliable ignition, and clean burning at a reasonable price. Each cartridge fires a 55-grain bullet at a muzzle velocity of 3,270 feet per second. The reloadable brass cases are sealed at the primer and neck for long-term storage. Safety note: This is 5.56 NATO ammunition and will function well in most AR-15 rifles; however, it may not be suitable for sporting firearms chambered in .223 Remington. Check with the firearm manufacturer if in doubt. 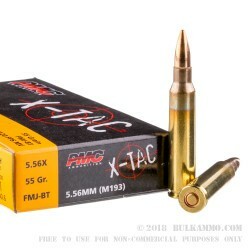 PMC X-TAC is a brand of the Poongsan Corporation, a major ammunition manufacturer headquartered in South Korea. Poongsan’s vast production capacity supplies both American shooters and South Korean military personnel, and achieves impressive economies of scale through vertical integration. At the same time, the company ensures the consistency and quality of every batch of ammo through rigorous electronic testing. Super fast delivery, great product, excellent company. Best inexpensive brass ammo you can buy! I was very pleased with this PMC ammo. I've ordered 1000rds and have gone through 500rds so far and no failures what so ever. Will definitely buy another 1000rds very soon. Great Deal on ammo. Super fast shipping. Ive never bought ammo online, and for the new people wondering some questions.. Yes, the ammo gets deliver to your front door step. Yes this website is legit, I just bought 1k rounds of 5.56x45 and it arrived and i can't wait to go to the range. Im also from "California" so 5/5 stars from me! And in case you're also wondering, you save tons of money buying it bulk! Do the math! Ran 200 rounds thru two of my AR's. No problems. Nice clean ammo. This was my first bulk ammo buy and the entire experience was much better than I thought it would be. I just had it in my mind that it would be a hassle to buy it online, then a really long wait time, and when it finally shipped it probably wouldn't ship all at once. I was pleasantly surprised when four days later I had my entire order neatly packaged and in my living room. Best price on ammo I could find. I was very pleased with this product and the response time of delivery! I have nothing but praise for PMC ammo. I've never had an issue with PMC. It's the cleanest, best looking and best priced ammo out there. I will definitely buy this again. Customer service is awesome, received email several times to notify me it shipped. Great price, Fantastic delivery time!!! 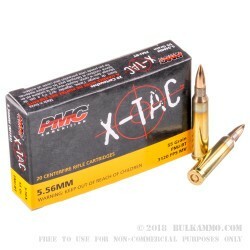 Shooting this PMC XTAC 556 AMMO along with the PMC bronze in 223, I found both fired equally well in my Rock River Arms Varmint A4 rifle. I think the 556 round comes out of the barrel a little hotter, in my opinion. You guys are the best. Fast and professional. Could not have gone smoother! I got my first box of 1000 rds, it was the best Ammo I have every used. No jams, no misfires even after shooting 400rds my AR15 had very little residue. The service with bulk ammo is excellent. I am very happy with the service and quality of rounds this company sells. My order arrived very quickly within 4days of ordering. The price was great and the product performs very well. I ordered at the end of the year and even with the holidays +weekend; I received my order within 5 days. Quite Impressive. Received the ammo 3 days after order and have ran a couple hundred rounds through my Colt LE6920. No issues at all with this ammo even on a brand new rifle. Fired several hundred rounds through my new M&P15 at a rifle qualification class. Great accuracy, 100% Reliability, and shot pretty darn clean compared to what the other guys were using. Awesome price damn good ammo. This is great ammo, price is great! Got here in 2 days! Very consistent good groups reasonable price and very clean. That's what I look for in my ammo. Awesome, accurate and reliable ammo! Excellent all the way around extremely impressed! Recomend to anyone in a heartbeat! From a 27 year military veteran. Have fired 2000+ rounds with this ammo I have had no misfires. I used this ammo several times now and I have been beyond impressed with it. hardly any FTF at all. clean ammo. the service from Bulkammo is great shipped fast to my house. I recommend using this ammo. Great service! Delivered right at my front door. Will order more in the future. Thank you. Super fast shipping! No problems at all with the ammo. No feed, eject, or fire problems. I ve shot my share of PMC in assorted calibers and have been satisfied. The 5.56 I bought from Bulk Ammo did not disappoint. Price was as good as it gets, shipping was flawless. Put around 500 of the 1000 purchased through my AR at an "Urban Rifle" shoot. Reliable ammo at great price!!! Reliable ammo at great price!! Awesome value! Haven't seen appropriate prices like this for a LONG time! This is good ammo, anybody can tell you that. Go do your homework on Google if you are unsure of what kind of ammo to purchase. After you know what you want, the next step if finding a place to buy. 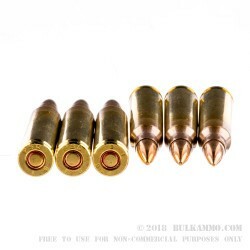 I will absolutely recommend Bulkammo.com to Everyone looking for ammunition! I am exceedingly impressed buy how painless and QUICK it was. Ordered on a Thursday, arrived on Saturday! Amazing! As long as the price stays right, I will absolutely be a returning customer!! Will keep buying this ammo! Shooting a Daniel Defense AR-15 carbine length with a 2 MOA red dot optic. Putting ten out of ten in the 10 ring at 100 yards.......and I'm 67 years old. I got 1,000 rds am about halfway thru them, NO problems, and pretty clean too! Easy to clean my AR15. Shot 300 rds in one day, very accurate the range only goes to 100M but spot on at that distance, Would like to see how it does at 400-500 meters. I use open sights and this ammo knocks the snot out of 10 inch steel targets @ 100M will be getting another 1,000 after payday. 800 yard sub minute groups. I shot a sub MOA group(open sights) at 800 yards with this ammo. The ammo is great but I don't like the cases for reloading. Arnold S.
Why go any where else? Forget trying to pick up ammo at Dicks or Cabelas. This is the only way to buy ammo if you enjoy the sport. Still waiting for the other products I need to show up. Only a few FTF (2 or 3) out of 3000 rounds, not bad. Very few stray shots. I decided to play around a bit with a "wanta- be" Rambo talking trash. Ended up shooting 1 inch groups at 400 yards, ( sand bag rest warm bore). Was really happy with this ammunition. Perfect performance. Ended up shooting almost 400 rounds. a jam or malfunction. Gun wasn't take dirty either. Will buy again. This is my 3rd order with Bulk Ammo.....5.56....223....40 cal. My order is always delivered on time. I usually order PMC and I never have had an issue with this product. I fire both the 5.56 and the 223 in my Daniel Defense M-4 V1 carbine length AR-15. Great ammo and quick shipping. My previous review only gave 3★, Bulk Ammo is the best 5★★★★★. Second order of this ammo and really good, consistent, group pretty good for an old man and tired eyes. Great deal in these times. Great ammo. Not a single misfire from my M&P15 sport. Awesome shipping. What makes the Ammo, is the company/s behind it. Bulk Ammo is what makes this deal sweet. Fast delivery and competitive pricing, at a time where threats of Govt. restrictions on our freedoms have driven prices through the roof. I applaud Bulk Ammo for their ability to keep their products within the ball park without gouging customers. I also appreciate their overbox service; allowing deliveries to remain on my door step for the few hours until someone is able to retrieve them. Good accuracy and flawless functioning of this PMC load in my Windham AR. What is more, bulkammo customer service was second to none and my shipment arrived very quickly. Ordered early on a Friday and arrived the following Wednesday, and over a holiday weekend at that. Steve has definitely gained my future business. Dealing with BulkAmmo couldn't be easier or faster. I ordered late on a Friday afternoon and had the shipment sitting on my doorstep when I got home from work on the following Tuesday. That's fast! This is the first 55gr I used in my AR15 and I'm completely satisfied. Q: Are these rounds green tipped? A: Hello Tym, This ammunition is a standard M193 load, meaning it's loaded with a standard 55 grain copper jacketed, lead core projectile. This specific round does not contain a steel penetrator. Q: Are these round's Boat Tail like the PMC Bronze? A: Hello Scott, According to PMC, the 55 grain M193 5.56 round is also loaded with a FMJBT style projectile. Q: Are the primers crimped? A: Hello Rick, PMC does note that the primers on this 5.56 ammunition are crimped. Q: Are these packaged in stripper clips? A: Hello! This ammunition is packaged in standard 20 round boxes with 50 boxes per 1000 round case. A: Hello Bill, PMC does not use any corrosive components in the manufacturing of their ammunition. Q: Are these new ammo or reloads? A: Hello Mike! All PMC ammunition is new manufacture. They do not produce any remanufactured ammunition currently. Q: Please tell me, what is the muzzle velocity of this round? A: Hello! The Muzzle velocity of this PMC 5.56 round is 3270 fps as listed by the manufacturer. Q: Since this is M193 spec ammo, is it also boat-tailed shaped bullet (FMJBT)? A: Hello, Yes, these 55gr. FMJ rounds by PMC in 5.56 are boat tailed. They make excellent target rounds in 5.56 and should function great in your 5.56 firearm. Q: Is this ammo manufactured in the United States? A: Hello Andrew, These 55gr. FMJ rounds in 5.56 by PMC are manufactured in South Korea. PMC makes excellent ammunition and you shouldn't have any problems with it. Q: Are the primers non corrosive? A: Hello Klaus, No, the primers in these 55gr. FMJ rounds in 5.56 by PMC are non-corrosive. You won't have to worry about corrosive primers with these rounds. A: Hello Eric, Yes, the brass with the 55gr. M193 FMJ rounds in 5.56 by PMC are new and not reloaded. You can reload these cases without a problem. Q: Is the above (5.56x45 Ammo by PMC) the same as 5.56 NATO? A: Hello Dar, Yes, the PMC 5.56x45 is the same as NATO 5.56, and is safe to shoot in any firearm chambered in 5.56. The PMC 5.56 rounds are brass cased and boxer primed as well. Q: Can you tell me if this ammo has a steel core or not? My range does not allow steel core ammo to be fired. A: This 5.56x45 ammunition from PMC features a lead core and does not contain any steel in the core or on its jacket. The jacket is a copper composition. These properties mean the bullet will not attract to a magnet which will be allowed in most indoor ranges.